The SQL IIF function is the new built-in Logical function introduced in SQL Server 2012. We can consider the Sql Server IIF as the shorthand way of writing IF Else, and CASE statements. If the given Boolean expression (or test condition) is true then it will return True_Value and if the condition is false then False_Value will be returned. In this example, we are going to use the SQL Server IIF function to find whether the person is eligible to vote or not. In this example, we are going to use the SQL Server IIF function to compare the string data. Here, we used the ‘%’ wildcard inside the second SELECT Statement so, I suggest you to refer SQL LIKE article for further reference. 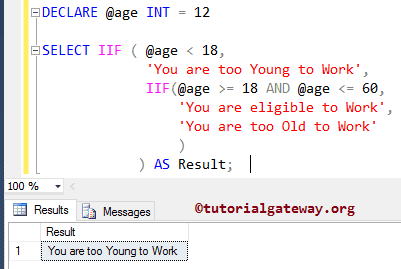 In this example, we are going to use the Sql Server Nested IIF function to find whether the person is eligible to work or not. First, we declared an integer variable called @age and assigned some value. If the Nested condition fails then it will execute the value at third argument, which is You are too Old to Work. 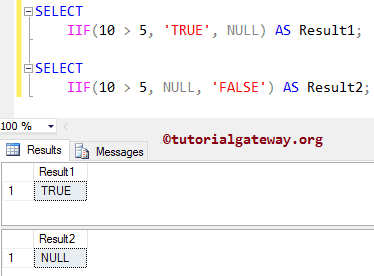 You should be careful while you are working with NULLs inside the IIF function in Sql Server. Following series of examples will help you to understand the consequences. 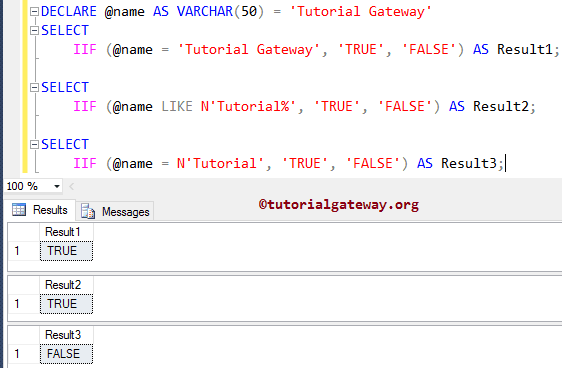 We can overcome the errors occurred by the NULL constants in Sql Server IIF function using the parameters.